Scotts® Turf Builder® Thick'R LawnTM Tall Fescue Mix has everything you need to help turn weak, thin grass into a thicker, greener lawn. With this 3-in-1 solution get up to a 50% thicker lawn with just one application*, guaranteed! Thick'R Lawn contains soil improvers for enhanced root development, seed to fill gaps with new grass, and fertilizer to feed new grass and thicken and green existing turf. This product is intended for use on an entire lawn and can be applied easily with a Scotts® spreader. 12 lb: 1,200 sq. ft.
40 lb: 4,000 sq. ft. This product is designed specifically to repair thin lawns and is intended for application to the entire lawn. Fall and Spring are the best times to use Thick'R Lawn™. Seed germinates best anytime temperatures are between 60°F and 80°F and all danger of frost has passed. 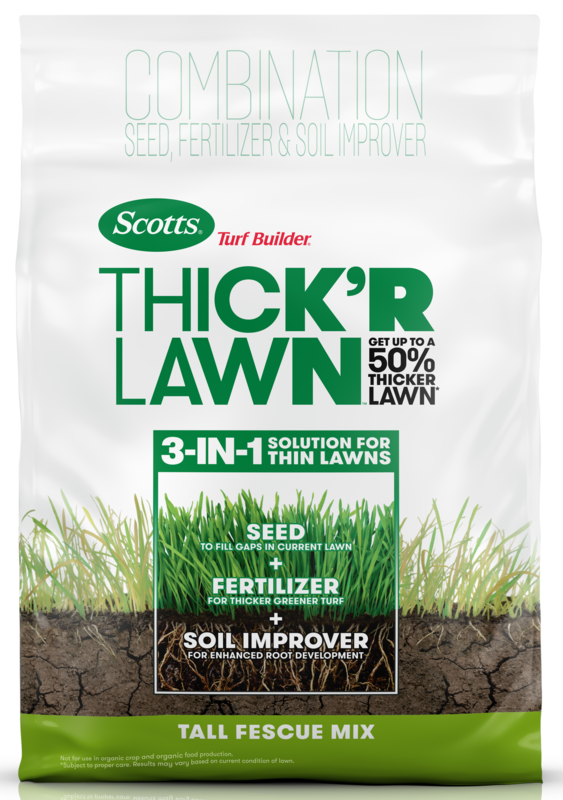 Scotts® Turf Builder® Thick'R Lawn™ is a great addition to your lawn care program with 1 application in the spring and 1 application in the late summer/early fall. If for any reason you, the consumer, are not satisfied after using this product, you are entitled to get your money back. Simply send us evidence of purchase and we will mail you a refund check promptly. For more details, click here. Everything you need to help turn weak, thin grass into a thicker, greener lawn. *Subject to proper care. Results may vary based on current condition of lawn. Thick’R Lawn Tall Fescue contains seed to fill gaps with new grass, fertilizer to feed new grass plus thicken and green existing turf and soil improver for enhanced root development.